Do the gods have free will? It’s a question that occurred to me while I was joining my local Quaker community in silent worship this morning. I didn’t share it with that community because my thoughts were somewhat inarticulate. I think it’s been pretty well established that humans have free will. Many religious scholars argue that free will is an essential part of the human condition. Maybe it’s a gift, maybe it’s a test, maybe it’s both or neither. However it came to be, the very need for things like a code of conduct or ethics, or laws to live by, springs forth from the free will of humankind. Much of the evil done by our species upon itself has entailed trying to break that will, or strip it from people to make them submissive and obedient. In Hellenismos, the Moirae, the aspects of fate, guided humans but did not bind them. Conscious choice could lead to a new destiny, as could intercession by Zeus, or perhaps others of the gods — my research is incomplete. But what of the gods themselves? We know that an oath sworn by a god upon the river Styx could not be broken. That’s a lot more restrictive than any oath ever sworn by a mortal tongue. So too, I have not found any prophecies about the gods which they averted. What came to me in a moment of prayer and mediation was that the gods, unlike humans, are irrevocably bound to their fates. We, as the sole holders of free choice, drive that fate through our actions. Gods can languish and be forgotten, as they are in the novel American Gods . When they are honored and worshiped, the offerings and requests they receive literally shape their identities and actions. By our worship, we create our gods, and define how they may affect our lives. This is a new way for me to look at my religion, and I think it probably applies to any path. Atheists give no gods power over their lives. Agnostics and lapsed Abrahamics don’t allow much divine influence, if any. Pagans, many of whom have consciously chosen their faith, are often swept away by the competing influences of various deities. Some people find their way back to the faith of their heritage, or that of their childhood, or that of their heart; these are people who have unconsciously decided that they desire some divine relationship. The paradox of belief seems to be that no god can exist without it, and close inspection quite easily brings all the doubt needed to dispel a god’s power. Sometimes. I still don’t know fully what I think of what I’ve written here, but I’m putting it out to the Universe for consideration. I’ve long preferred using local banks and credit unions over large mega-banks. I selected the local bank I use for most of my business and family banking based on its location, knowing full well that its online presence was poor. Being able to go into the branch and speak with a person who can make decisions was more important to me. But just because a bank is local doesn’t really make it better. Sometimes I feel that local banks try to get away with stuff just because people prefer the local banking experience these days. Case in point: I deposited some cash in my account, using the branch’s ATM, near the end of the day. I understand that those deposits aren’t counted and credited the same day, but timing was not absolutely critical. After making the deposit, I went home and arranged to transfer that cash to an online account I keep. Puzzling as it is to me, transfers between banks take some time, even in the age of electronics. But my online bank sent me an email reply, telling me that the transfer would be completed in two days, which is plenty of time for the cash deposit to hit. After all, cash doesn’t have to “clear,” because you know it’s good. So imagine my surprise when my local bank hit me with a thirty-dollar fee. From what I understand, the transfer request hit before the cash was counted and posted to my account. My local bank has aggressively tried to get me to opt-in to overdraft protection by playing on my fear that I will be embarrassed at the check-out counter if my debit card is declined, but I said no thanks. The reason I use a debit card is to ensure that I don’t spend more money than I have, and my local bank wanted to take away that protection, and replace with with more thirty-dollar fees. So I confirmed that they didn’t try to overdraw my account. Well what happened? Apparently they charged me a fee because they didn’t execute the transfer. I got charged thirty dollars because a computer program didn’t run. And it didn’t run because cash, apparently, does take a long time to clear. So I’m losing confidence in my local bank. Once upon a time, banks made their money very transparently: they paid people interest on the money they saved, and charged people more interest on the money they borrowed. I don’t see why we can’t get back to that. If the services we demand cost a lot, then we get a smaller return on our savings, or pay more interest on our loans. The only reason to tack on fees (pages and pages of fees) is in the interest of opaque business practices. Allegedly someone from my bank is supposed to call me about this. Maybe they will reverse the fee, but I would feel better if they reversed the policy of tricking their customers instead of just making it easy to see what banking costs. I don’t have a problem with banks making money for their services, but I do have a problem with a fee structure which takes advantage of those customers. Depending on how that conversation goes, I may or may not edit this post to mention my local bank by name. Yeah, I get that. It’s what we do. It’s why cancer doesn’t always get diagnosed early enough and neighborly disagreements end up in court. It’s the belief that the inspected life gets worse. Yes, it’s depressing to look at a sea of debt, realizing that you’re at the bottom of it. So depressing that you just want to look away. And that’s when you need to stare at the ugliness, unblinking, and accept what it is in this moment. Because that’s all a snapshot of your finances is — it’s a moment. The next moment will be different. Maybe not much different, but money magic is slow magic. Small changes reap bigger rewards. Anyone — and I mean anyone — can save ten percent of his or her income. That’s what my oldest friend’s father told me when I was a young man struggling with debt. Now I’m an older man struggling with debt, and that’s true in part because I didn’t always remember his words. Why is this true? In the United States, at least, people at any income level can piss away ten percent of their income and not even notice. Cigarettes, soda, a video game. Gas when you could have walked, super-sizing dessert, betting on a football game. Who knows where the money goes? You can save ten percent simply by being mindful. Pay yourself first, ten percent right off the top. Make it automatic if you can; either payroll deduction or an automatic withdrawal that puts the money in a different bank account. If you don’t have a bank account, consider opening one, or finding some place secure where you can access your money, like Dwolla. Scared? Then save less, but save something. A dollar a week. A month. Something. Make saving a habit. When you have more you can adjust, but you need the habit of putting money away some place you aren’t likely to spend it. Ten percent. Anyone. Got it? So as a quick follow-up about my experimentation with homemade laundry detergent, I did a cold wash yesterday and when I pulled it from the dryer this morning I found visible little chunks of washing soda in the lint trap. Just a couple, but I will watch closely as I fold. Maybe I need to grind the stuff up more, or maybe I need warmer water, or maybe it won’t be a big deal either way. In amongst my ruminations about the role of money in an earth-based spirituality, I find that I return to the place where frugal and environmental meet. My mother was a forerunner of the “reuse” part of the waste hierarchy, because she had to make too little money feed and clothe too many children. Being mindful of how one spends one’s money often has the side effect of being the more sustainable choice. So I thought it would be worthwhile to look at some of the homemade products I’ve adopted, or I’m testing. They are less toxic, and because the ingredients are packaged in bulk (often in recyclable cardboard). they use less plastic packaging. They also tend to all look very similar (off-white, flaky-to-pasty), so it’s a good idea to label them carefully, lest one get a surprise when brushing one’s teeth. Deodorant. Baking soda, tea tree oil, coconut oil. Rock-hard if you keep your house cool in the winter, and liquid for some time if you don’t air-condition in the summer. The coconut oil was optional in the recipe I found, but I haven’t tried it powdery yet. Toothpaste. Baking soda, mint extract, sea salt. The salt was the optional ingredient here (more abrasion), so I used about a tenth the recommended amount. I’ve been using it for two weeks and I swear it tastes saltier now, like the salt ate the mint. Laundry detergent. Ivory soap, borax, Arm & Hammer Super Washing Soda . I shaved a bar but using flakes if you can find them will yield less packaging. The last product is soda ash, a water softener, while the borax is a detergent, which isn’t the same as soap. First wash turned out clothes without visible stains or detectable odors. Shampoo. Water, baking soda. Seriously. Hair rinse. Water, cider vinegar, cinnamon stick, vanilla extract. I tend to lean more on the vinegar than the water, because it fizzes away the baking soda and leaves a clean finish. I stopped using this recipe when I installed dreadlocks, but I plan on returning to it as soon as my present supply of “residue-free shampoo” runs out. 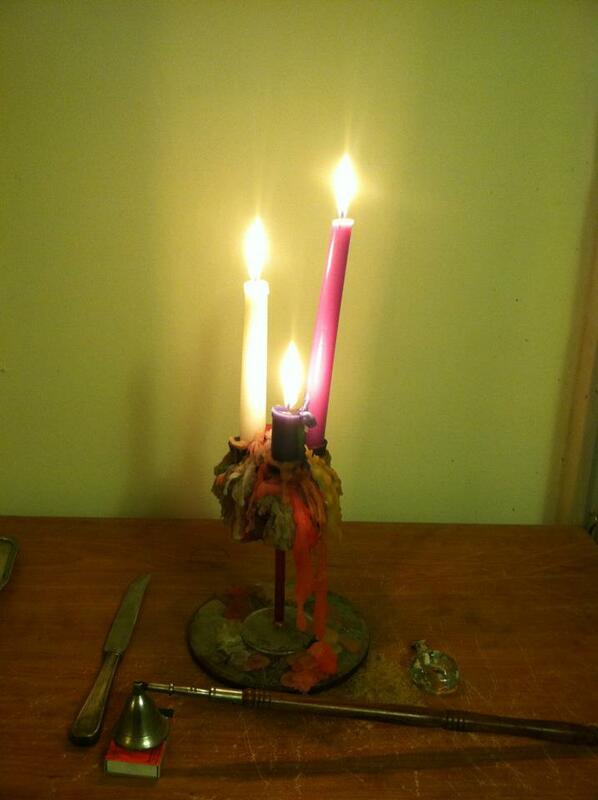 Save money, reduce waste, be a more solvent and earth-friendly Pagan. So what if the tooth-brushing is saltier than it used to be?